In its opposition brief against Apple's US motion for a preliminary injunction against sales of its Galaxy S, Infuse 4G, Droid Charge and Galaxy Tab 10.1, Samsung is claiming a depiction of a video device from "2001: a Space Odyssey" as prior art. Samsung's full opposition filing isn't yet public as it was filed under seal, but FOSS Patents has reported on one element the company plans to use in its defense: that the appearance of a device in a work of science fiction could be referenced as prior art to invalidate design patents. Samsung depicts a scene from "2001" where actors in the futuristic 1968 Stanley Kubrick film watch a TV news broadcast from what appears to be a digital newspaper while they eat a meal. The company describes the scene as depicting astronauts "using personal tablet computers." Samsung states that "the tablet disclosed in the clip has an overall rectangular shape with a dominant display screen, narrow borders, a predominately flat front surface, a flat back surface (which is evident because the tablets are lying flat on the table's surface), and a thin form factor." The movie does not, however, depict any interaction with a user interface on the device. Other works of science fiction have depicted tablet computers in various forms. Fictional or artistic representations of inventions can be used to invalidate design patents. Robert A. Heinlein, who was described as one of the "Big Three" science fiction writers alongside Isaac Asimov and Arthur C. Clarke, wrote detailed descriptions of the concept of a waterbed while hospitalized in the mid 1930s. His writings were later used as prior art to prevent a patent from being awarded in the 1960s as the waterbed started to become popular. Apple was recently sued by Klausner Technologies over a patent claim against the iPhone's Visual Voicemail, a feature that could have similarly been defended with science fiction prior art. However, Apple settled with the company and licensed its patent. However, Samsung has far more at stake in this case because Apple is seeking to block a wide range of its products as willfully infringing copies, rather than just seeking some licensing revenue. Apple notes in its complaint that it "is limiting this motion to new products that Samsung recently released in the U.S. Apple has not targeted the unreleased Galaxy S 2 phone and GalaxyTab 8.9 tablet computer. Apple reserves the right to seek a preliminary injunction against those two products as their release becomes imminent." The company adds that "unless enjoined, Samsung's sales of a new round of copycat products will cause irreparable harm to Apple that cannot be adequately compensated by damages. Accordingly, Apple requests that the Court issue a preliminary injunction and ensure that innovation  not unlawful imitation  is protected." Apple's US case for a preliminary injunction against Samsung relates to three US Design Patents (D618,677, D593,087 and D504,889) and a technology patent (7,469,381 described as "list scrolling and document translation, scaling, and rotation on a touch-screen display") which Apple has previously asserted against HTC and Nokia. Apple's D677 and D087 patents relate to the design of the front face of the iPhone, while D889 pertains to the iPad's overall design. The '381 patent is "a clever method for displaying images on touch screens: when one uses a finger to drag a displayed page past its bottom edge, for example, and releases the finger, the page bounces back to fill the full screen." Apple stated that Nokia previously initiated a reexamination of the '381 patent "which included the best prior art references Nokia could find," but the Patent Office confirmed the validity of all twenty claims related to the patent. Samsung's "2001" prior art appears to be directed at elements of the D889 design patent. However, Apple's complaint cites previous court decisions ruling that "the critical issue is whether 'the effect of the whole design [is] substantially the same'  'minor differences between a patent design and an accused articles design cannot, and shall not, prevent a finding of infringement.'" Another case Apple cites found "if the accused design has copied a particular feature of the claimed design that departs conspicuously from the prior art, the accused design is naturally more likely to be regarded as deceptively similar to the claimed design, and thus infringing." 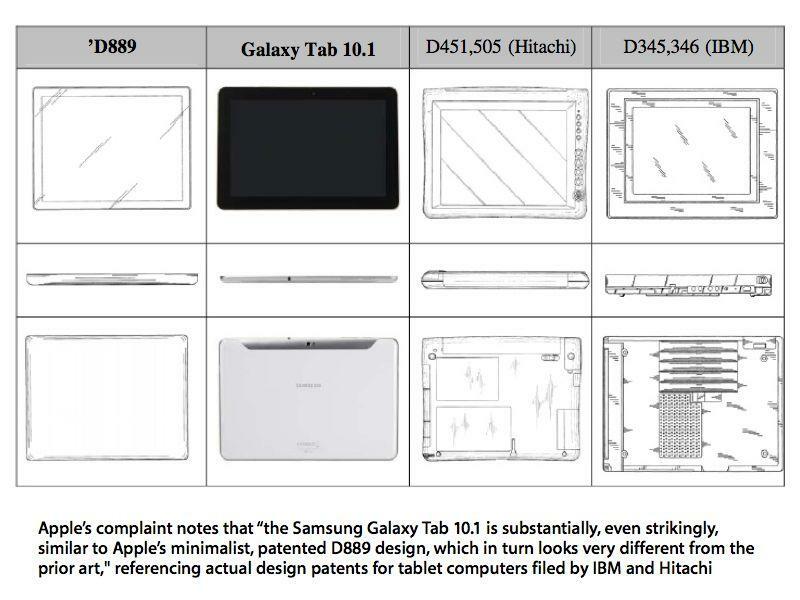 Apple's complaint notes that "the Samsung Galaxy Tab 10.1 is substantially, even strikingly, similar to Apples minimalist, patented D889 design, which in turn looks very different from the prior art," referencing actual design patents for tablet computers filed by IBM and Hitachi. 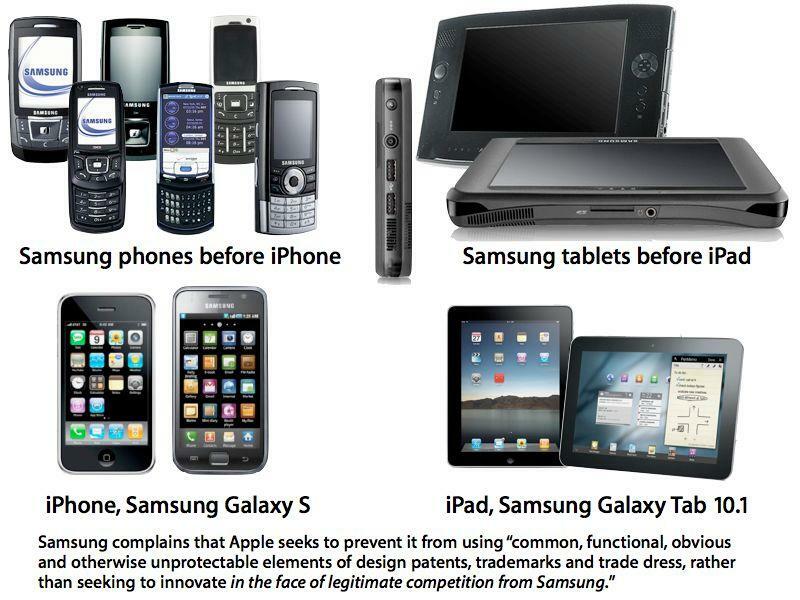 Countering claims by a Dutch columnist for IDC that Apple had "doctored evidence" to fool the courts in Germany and the Netherlands, Apple notes in its US complaint that "differences between the Samsung Galaxy Tab 10.1 and Apples patented design are trivial and legally insignificant: the aspect ratio, thickness, and edge profiles do not appear to be absolutely identical in the Tab 10.1 and Apples patented design. "But as discussed above, a product infringes a design patent even if it differs in several details, so long as an ordinary observer would view the overall appearance to be substantially the same. These minor differences do not affect the substantial similarity between Samsungs tablets and Apples claimed design when viewed as a whole, especially in light of the prior art."